WASHINGTON (CNN) - The Justice Department announced Tuesday that it has begun a federal rule-making process that could reinterpret the legality of certain bump fire stock devices, a piece of equipment that enabled the Las Vegas gunman in October to fire on concertgoers more rapidly, mimicking automatic fire. The announcement comes the day before the acting director of the Bureau of Alcohol, Tobacco and Firearms is set to testify before a Senate Judiciary Committee hearing on the device and amid calls from legislators to prevent the future sale of the part. Investigators have said 12 bump fire stock -- or bump stock -- devices were found in the shooter's hotel room in Las Vegas. Fifty-eight people died in the attack. "Possessing firearm parts that are used exclusively in converting a weapon into a machine gun is illegal, except for certain limited circumstances," Attorney General Jeff Sessions said in a statement. "The regulatory clarification we begin today will help us to continue to protect the American people by carrying out the laws duly enacted by our representatives in Congress." 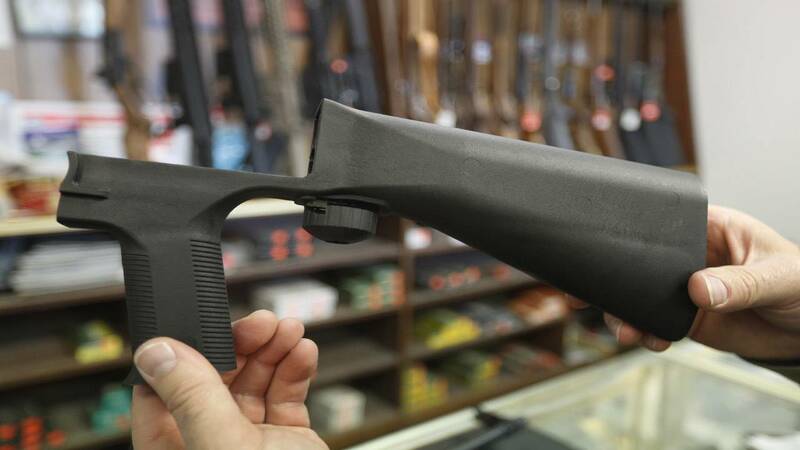 Bump stocks were approved for sale under a 2010 memo from the ATF's Firearms Technology Branch. Because the device "performs no automatic mechanical function when installed" and the shooter must still apply "constant" forward and rearward pressure to a gun equipped with one, the memo said the agency found the bump stock was a "firearm part," and therefore not regulated under federal gun laws. Also known by the brand name Slide Fire, bump stocks modify rifles like the AR-15 to allow it to fire in rapid succession, simulating automatic fire. They work when applied to a rifle's receiver by using the recoil effect of semiautomatic rifle fire to "bump" the gun's trigger back into the trigger finger, causing the weapon to discharge repeatedly. Using rifles equipped with the devices, the Las Vegas gunman was able to shoot 1,100 rounds in less than 10 minutes, at times firing off 100 rounds in the span of a few seconds, according to Steven Wolfson, the district attorney of Clark County, Nevada, which includes Las Vegas. "A bump stock -- it should be banned, it should be disallowed, it should be wiped off the face of the earth," Wolfson said last week. In the wake of the shooting, lawmakers called for a fix to prevent the sale of the device. Bipartisan legislation was introduced in the House and the Senate to ban the bump stock, while others placed the onus on the ATF to reissue the guidance around the legality of the device. Lawmakers led by Republican Rep. Adam Kinzinger of Ohio asked the ATF to consider a rules change that would define rifles equipped with bump stocks as machine guns, already prohibited under existing regulations. House Speaker Paul Ryan and the NRA both threw their weight behind a regulatory fix instead of a legislative ban on the device. In a December 11 letter addressed to Kinzinger and obtained by CNN, the assistant director of the ATF, Christopher Schaefer, wrote, "After thorough consideration, ATF has decided to initiate the process of promulgating a Federal regulation interpreting the definition of 'machine gun' in the National Firearms Act and the Gun Control Act to clarify whether certain bump-stock devices fall within that definition. The estimated timeline for a ruling, congressional sources tell CNN, is eight to 12 months.